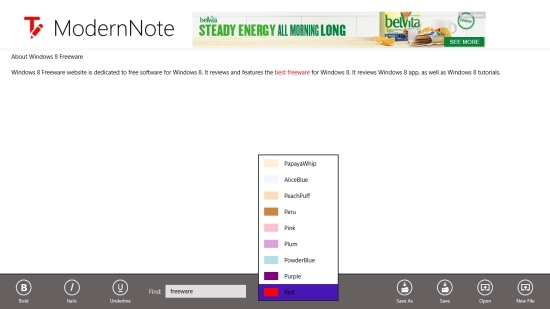 ModernNote is a free Windows 8 Text Editor app that lets you create, view, and edit rich text documents easily. Using this simple yet intuitive text editor app, you can create and edit text documents and save them on your PC or Skydrive, in various formats such as TEXT, CSV, RTF, HTML and more. This free Windows 8 text editor app is extremely lightweight and easy to use. Apart from various typical features of a modern text editor, ModernNote has advanced features like spell check and text formatting as well. You can cut/copy and paste the desired text. You can also drag the app’s screen to create a snapped view. ModernNote can be availed freely from the Productivity category of Windows Store. Search for the app using Win + Q keys or use the link give at the end to view the app directly in Windows Store. Let’ have a look at how you can use this free Windows 8 text editor app. To make use of the app, all you need to do is to install it on your Windows 8 system. As you launch the app, you will land on the main screen of the app. A bottom flyout will appear on right-clicking on this screen, with various functional options: Bold, Italic, Underline, Find, Color Text option, Save As, Save, Open, and New File. To create a text document, you can straight away start typing on the main screen of the app. You can also cut/copy and paste the desired text on the app’s screen and format it. To cut/ copy and paste text on the app’s screen, do a right click. A popup of the concerned operations will appear to let you select and process the operation. If you want to find a particular word in the document, just enter that word in Find window in the bottom flyout , and it will get highlighted. You can change color of text in your document by selecting the desired color from various options given in the bottom flyout. To save the text document, click on Save As option. You can view the saved documents later by clicking on Open option displayed on the bottom flyout. You can also create snapped view of the app and conveniently access multiple files. 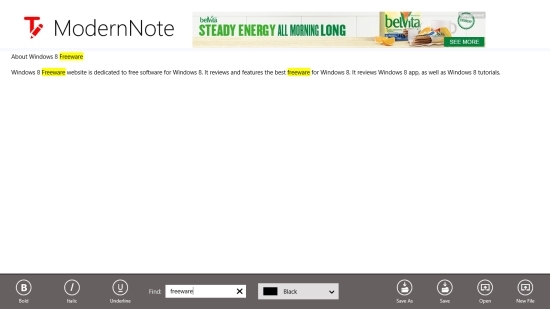 ModernNote is a nice free Windows 8 text editor app with basic text formatting features. You can save text documents on your Skydrive, and read them later also. However, had there been options to change font style and size, the app could have been better. Try this app to create rich text documents. Share your feedback via comments.